To help you determine whether your exposure settings are on cue in M (manual) exposure mode, the Nikon D5100 displays an exposure meter in the viewfinder and Shooting Information display. The meter is a little linear graphic. To activate it, just press the shutter button halfway and then release it. The minus-sign end of the meter represents underexposure; the plus sign, overexposure. So if the little notches on the meter fall to the right of 0, the image will be underexposed. If the indicator moves to the left of 0, the image will be overexposed. The farther the indicator moves toward the plus or minus sign, the greater the potential problem. If the meter blinks, the amount of over- or underexposure has exceeded the range of the meter. When the meter shows a balanced exposure, you’re good to go. In the other exposure modes, the meter flashes in the viewfinder and Shooting Info screen if the camera anticipates an exposure problem — your cue to adjust exposure settings until the meter disappears. In dim lighting, you may also see a blinking flash symbol. It’s a not-so-subtle suggestion to add some light to the scene. A blinking question mark tells you that you can press the Zoom Out button to display a Help screen with more information. Keep in mind, too, that the meter’s suggestion on exposure may not always be the one you want to follow. For example, you may want to shoot a backlit subject in silhouette, in which case you want that subject to be underexposed. In other words, the meter is a guide, not a dictator. In addition, remember that the exposure information the meter reports is based on the exposure metering mode, which determines which part of the frame the camera considers when calculating exposure. At the default setting, exposure is based on the entire frame, but you can select two other metering modes. Adjust the meter shutoff timing. The meter turns on anytime you press the shutter button halfway. But then it turns off automatically if you don’t press the button again for a period of time (eight seconds, by default). You can adjust the shut-off timing through the Auto Off Timers option, found on the Timers/AE Lock submenu of the Custom Setting menu. Reverse the meter orientation. For photographers used to a camera that orients the meter with the positive (overexposure) side appearing on the right and the negative (underexposure) side on the left, the D5100 offers the option to flip the meter to that design. 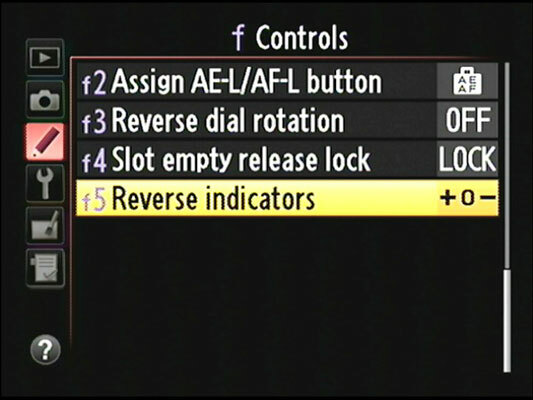 This option also lies on the Custom Setting menu, but on the Controls submenu. Look for the Reverse Indicators option.